Beauty, screening, vibrant seasonal color, shading, oxygen, fruits and nuts - Trees provide so many wonderful things. By planting just one tree, you will make a dramatic change to your property. Once a few things are taken into consideration, planting or transplanting a tree is a simple process. Review the hardscapes such as decks, patios, and pathways within your landscape. Consider how planting or transplanting a tree might affect these features, or future features, in your yard. Take into account conditions of your soil, sun and wind exposure, and the overall climate in your local region. Know your USDA Plant Hardiness Zone along with the Heat Zone for your area before making a tree purchase. How much space will you need to accommodate a new tree? Always make sure that a tree’s mature size fits your landscape. For example, a fully mature Live Oak, fifty feet in height, would dwarf a single-story home. 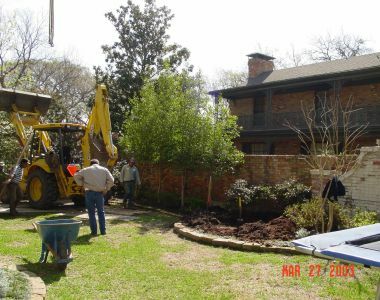 A better option near a house might be a small-sized tree, such as a Texas Redbud or a Crape myrtle with mature heights of no greater than twenty feet. While a Golden Rain Tree or Eastern Red Cedar with mature heights ranging from twenty to forty feet may be more appropriate for an open area in the yard. Armed with knowledge of your landscape, hardiness and heat zone information, and awareness of your landscape’s spacing issues, consult with a certified Arborist regarding a tree planting. 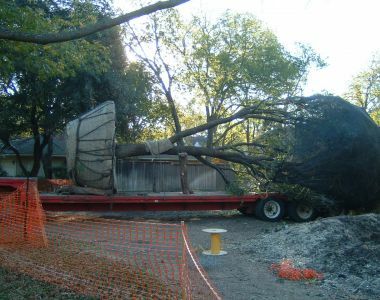 Certified Arborists are trained and licensed professionals, who specialize in complete tree care and maintenance including planting and transplanting, tree pruning, health care, and construction protection. Along with knowing the suitability of trees for specific climates and locations in your landscape, a good certified Arborist will also know which trees are native to your area and the correct time of year in which to have them planted. An Arborist will check that the desired planting location has appropriate drainage to suit the tree’s needs. They will take into account if the planting will require back-filling with new and fresh soil, or amending the existing soil with fully-finished compost or other soil amendments. Once your tree has been planted, a certified Arborist will provide an irrigation schedule along with maintenance recommendations for your newly planted tree. Costs for tree planting are largely determined by the species and size of the tree. Browse tree books, magazines, and YardHookup.com for tree planting or transplanting ideas. Prior to meeting with any Arborists, consider drawing a sketch of where you would like your tree(s) planted. Bring a list of desired trees to your Arborist consultation. This will give the Arborist a great starting point to work from. Request and check all references and credentials for potential Arborists. Verify that the Arborist’s license and insurance is current. Ask what the warranties and limitations are on your new tree.